During the meeting, Mr. Özgencil extended his gratitude and appreciation to Dr. Abu-Ghazaleh for his continuous Honorary Presidency of the Summit in the past years, affirming his active contribution in the 9th Bosphorus Summit held in 2018. 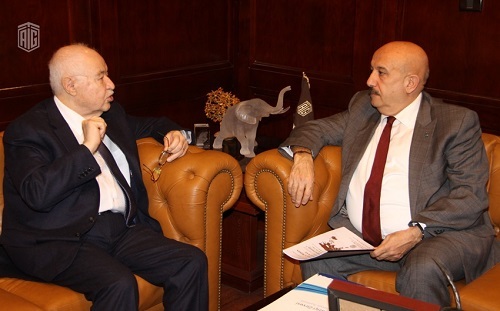 Furthermore, the Secretary General and Dr. Abu-Ghazaleh discussed the necessary arrangements for the 10th Bosphorus Summit which will be held at the end of this year and the two parties agreed on the agenda and main theme of the Summit which will be entitled: “New World System – 2020”. It’s worth mentioning that the Bosphorus Summit for International Cooperation aims at enhancing proactive multilateral and inter-disciplinary cooperation in the fields of energy, transportation, information and communication technology, health and agriculture as well as building youth capacities. It is considered a significant platform that gathers politicians, businessmen and entrepreneurs from countries of the Middle East and the world to discuss ideas and visions for implementation of doable projects.